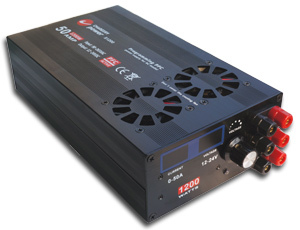 As far as large power of 1200W, efficiency and size is more important than small and middle power adapter. If efficiency=94%, means consumptive energy is 72W---1200×(1-0.94); if it is 85%, it will be 180W. Active PFC will improve the enery consumption from main power grid evidently. if efficiency is 85%, PF=0.7, the energy is 2016.8W. the surplus 699.3W (2016.8-1317.5) will be wasted as heat, and increase the power grid load. 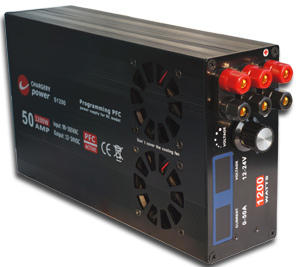 S1200 - 24V 50A - programming digital power supply is released now, optimize design repeatedly in past 14 months, the power supply reached up to 94% at 60% of load and AC220V, ultra low power consumption make sure its internal temperature under 60℃ and realize components' performance. Active PFC, Synchronous Rectification, ZCS and ZVS full bridge topology applied to powerful S1200. 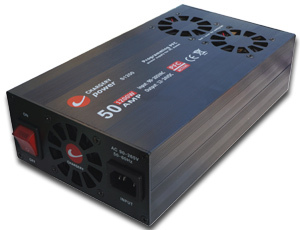 Especially, S1200 can output 1200W evan more at 90V AC, and get a converting efficiency of 86.85% at full load. AC 90~265V input, no matter where you are, S1200 can work perfectly. it is also equipped with both US / Japan and Europe AC plugs, world wide use need not any alternative switcher. Adjustable output voltage from 11.5V-24.5V is convenient for most of applications. Connect to any DC charger which is supposed to be powered by DC 12V~24V, the S1200 will provide up to 55 Amps 1200 Watts maximal. S1200 power 3 chargers simultaneously video on youtube. 3 outputs can do more chargers simultaneously. 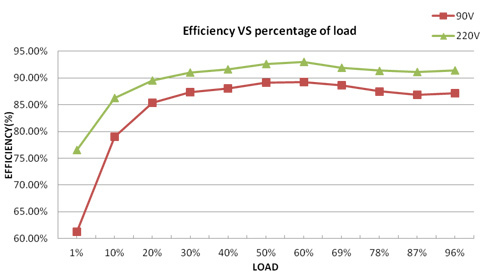 Efficiency: 94% at 60% load and 220V. S1200 is fully committed to compliance with the European Union’s RoHS directive.